Recently I was sitting with the 13 year old at a high school subject selection evening. She’s preparing for year 9, and has a couple of elective choices to make, so the school puts on an evening where all of this is explained to parents and students. There are two things you need to know about this particular 13 year old. First, she’s very academically oriented (and I’d say gifted too…but them I’m biased). Second, she has inherited an intense introversion and dislike of public speaking from her parents. We’ve both learned to do it, but it hasn’t been a fun ride. Anyway, where was I? Oh, right, subject selection. In the end she had one choice left to make, and the list of options was long. A whole bunch of arts subjects, some industrial tech stuff, and geography. I thought the choice was simple. She loves geography, would do well at it, would find it relatively easy. An easy choice. Naturally, she didn’t choose it (I mean she could have, but then this would have been a dull story, right?). She said to me “Dad, I’m going to choose drama”. “Oh, that’s good” I said out loud, desperately trying to play the cool, supportive, helpful parent. “Tell me why you’re thinking drama?”. The answer, when it came, floored me. Stopped me. Confronted me. Challenged me. Then and now. “Because I know I’m not good at speaking in front of groups. It makes me nervous, and I’m not good at it. I think if I do drama for a year, it will help me to find my voice. I can always do geography later”. Such is the wisdom of the 13 year old. Now let me hasten to say at this point that I have no objection whatsoever to drama as a subject. I wish I had the courage to do it (I would be hopeless, but I still wish…). We take a holiday to the same place (or at least the same kind of place). We stick with the same kinds of food. We make the safe, obvious career choice. And so on. Geography over drama, every time. In the organisation I work in, we are under some degree of stress. Our future is clouded. Under such stress, we choose geography time after time after time. We choose what we know. We choose the obvious. We choose to keep doing what we’ve always done. 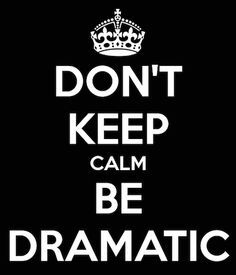 I can’t help but think that at this point in our life cycle, we should be consciously choosing drama. It’s left me both (a) incredibly proud of this child (even more than before…true); and (b) challenged in the way I go about my choices as a person, husband, father. I’m wondering what it means for me to choose drama. I’m a little nervous about the next choice I have to make. And if I’m honest, a little sad too….because I quite like geography! This entry was posted in leadership, parenting, stories from my life, wondering and tagged choice, drama, geography, parenting, risk. Bookmark the permalink.